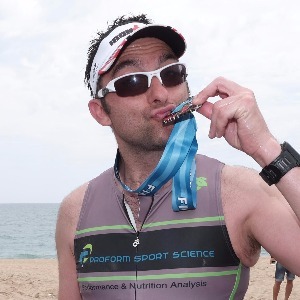 Proform Sport Science is run by Dr Howard Hurst, as multisport coach with a PhD in Sport Science, a registered Sports Nutritionist and ISAK anthropometrist. I offer training plans and 1-2-1 coaching back up by scientific research and have over 15 yrs coaching and research experience. As well as a coach I also works as a Senior Lecturer in Sport, Exercise & Nutritional Sciences at the University of Central Lancashire and has over 15 years expertise in sports and exercise physiology and nutrition. Over the years he has worked with athletes and teams at all levels from first time racers to Professionals. I have a PhD in Sport Science and I'm a Registered Nutritionist in Sport and Exercise, British Cycling qualified coach and ISAK accredited Level 1 anthropometrist. I have over 25 years of racing experience in running and cycling and now compete in triathlons at all distances from Sprint to Ironman and have completed running events from 5km to 50km ultramarathons. Success. Coach Dr Howard Hurst has been notified of your message.